Good morning friends, crafters and fellow bloggers. Hope you are all well. Happy St David's Day to any Welsh crafters looking in. Hard to believe it is March already!! It's time again for another card for the Christmas Card Club. This time Margaret asked us to use poinsettias on our card, but we could use any colour we chose. I never used to make traditional red or green cards, preferring more contemporary colours but this last year or so I am really loving using red - so here it is again! My card is 5 x 7" made from 300 gsm card. It was layered with red and white card. The top layer was run through the embossing folder after die cutting it, as was the red layer. Pearls were added to the flowers and tiny pearls to the centres of the flowers on the red embossed layer. I cut two of the Parisian Accents to give a shadow effect. If you would like to see what the other club members have made you can find their contact details in my right side bar. If you are keen to get a head start on making your Christmas cards and you would like to join us please get in touch. A really gorgeous card Christine, love the way you have split the layers with the lovely bracket die. A lovely card, I love red and white at Christmas. 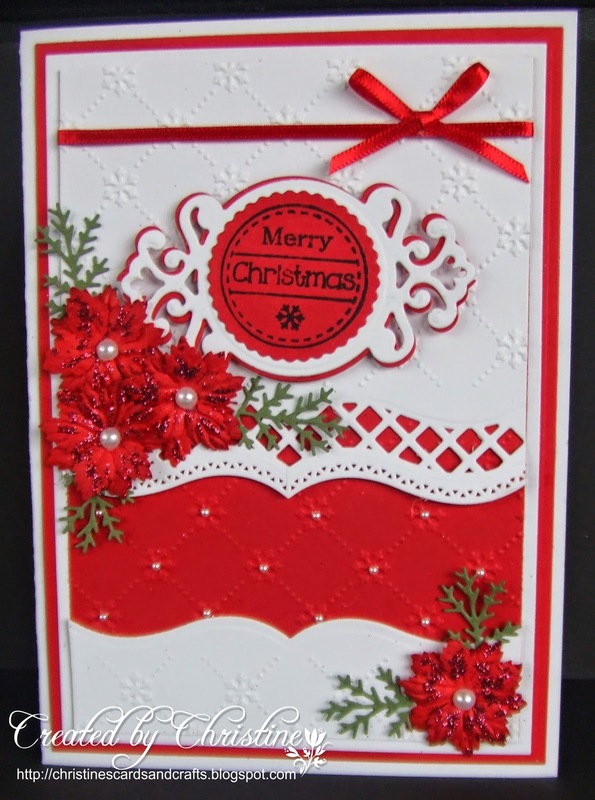 A gorgeous Christmas card Christine, love the red and white colour scheme. This is gorgeous Christine, I love the design and beautiful colours. Beautiful, just beautiful, love everything about it. Oh my word Christine this is so beautiful that design is stunning, so are the colours and flowers, excellent make. Stunning design and the red and white is one of my favourite combos. Its going to look super on someone's mantle this year. I love the red and white combination so it's a gorgeous card!I missed the 2 below, because I was on a holiday in Austria, buts I like them also!! Stunning card Christine and I can't believe how organised this is! Yes I'm loving the red of this card too. Looks stunning. Very crisp against the white of the card. Was running very late for this challenge. February just went in a flash. Hugs Mrs A. Sorry that I missed this beauty, Christine. This is stunning...love that pop of the red against the white...and your fabulous design.